I just started reviewing gadgets on Serious Eats, but I figured my blog readers might be interested in the reviews as well. I've been having a blast playing with gadgets, pressing buttons, slicing, dicing, whacking, flipping, and otherwise putting gadgets through their paces. The Serious Eats column runs weekly; I'll be recapping them here on an irregular basis. Maybe monthly - we'll see how they fit with everything else I do. You know those wine charms that you're supposed to put around the stem of a wine glass so people know which glass is theirs? I've never seen the point in that. Maybe it's the type of parties I go to, but I've never seen that sort or confusion over wine glasses. Beer cans, on the other hand ... Uh, maybe it is the type of parties I go to. But I've seen beer cans and pop cans abandoned at parties because people set them down while mingling, and when they come back there are three identical cans and no clue which is theirs. So they go find a fresh beverage and at the end of the night the hosts are picking up half-full cans of beer and pop that were abandoned during the night. That's one purpose behind the Beverage Barricade from Mom Invented, a little plastic gizmo that fits on the pull tab on beer or pop cans. These come six to a package, in six different colors. But color coding is only one purpose. This little gem also helps you open the can. Yet another thing that generally isn't a problem for me, but some of my more dainty friends don't like opening cans for fear of ruining a manicure or breaking a nail. I've seen all sorts of devices that purport to make can-opening less hazardous, so there's a market for it. 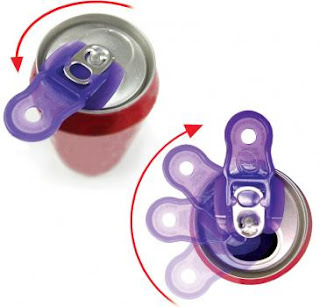 The third use - and yes, these little plastic tabs have yet another reason for existing - is that you can twist that pull tab around so that the plastic tab covers the opening on the can. That's the use that I found most ... useful ... and if you don't have any idea why, I can tell you a story about a buzzing fly and me spitting pop across the room on a nice summer night. And while the Beverage Barricade doesn't seal the can tightly, it also helps to thwart accidental spills - at least keeping them manageable. And if you need to store an opened can in the refrigerator, at least it's somewhat covered. While these aren't quite as chic as wine charms, they're probably not going to be used at your next elegant dinner party. They'd be perfect at a barbecue or picnic, and particularly handy when kids are around. Or flies. We all know what a garlic press is - a device that smashes garlic through small holes so you end up with bits of mashed garlic. While there are times when that's what you want, it's really not the same thing as mincing garlic. When you mince garlic with a knife, you have sharp cuts instead of smashed garlic. The visual difference is like difference between smashed potatoes and cubed potatoes. Oh, if only there was a magical kitchen tool that could cut garlic instead of mashing it! Ah, but there is! Enter the Microplane Garlic Mincer. Instead of smashing garlic through small holes, the mincer pushes them through a sharp grid, then a blade chops the pieces off into teeny-tiny garlic cubes. Of course, since the garlic isn't perfectly square going in, you'll have pieces that aren't perfectly square coming out. The larger the garlic cloves, the more cubes you’ll get and the fewer odd shapes. The again, you're not going to get perfect squares with a knife, either, even if that was your goal. Do I need perfectly square cubes of garlic? Probably not. But it was endlessly fascinating to squeeze the trigger and watch the garlic cubes pile up. The mincer is easy to use - just drop the peeled garlic into the chute and squeeze the trigger. Load more garlic, if you need more. This would be a great tool if your kids want to help in the kitchen, but they're not responsible enough to use a sharp knife. Cleanup was relatively easy – all of the pieces can be washed in the dishwasher. The only problem was that getting the metal grid out was tough the first few times, but then it got easier. I suppose you don't really need to remove that piece for cleaning, but it does make it easier to get the last odd bits cleaned out. I'll have to admit that I'm a big fan of Microplane products. I love the graters. I have a few of them. This mincer is well designed, it does what it's supposed to do ... but it's not exactly an essential tool. 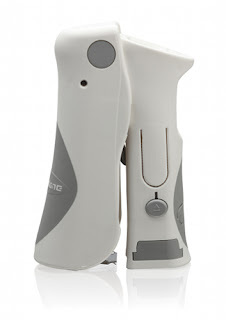 If you're adept with a knife, you might not need something like this. 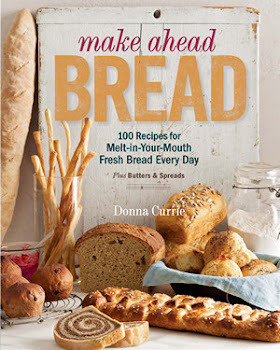 On the other hand, if you hate mincing garlic as much as you hate the mashed garlic that comes out of a garlic press, this might be a handy thing to have. And did I mention that it's endlessly fascinating watching the garlic cubes pile up? Yes, I am easily amused. There are some gadgets that I can't wait to try, and there are others that I think are absolutely silly. The Stem Gem fits in the second category. Never in a million years would I have taken this item seriously. 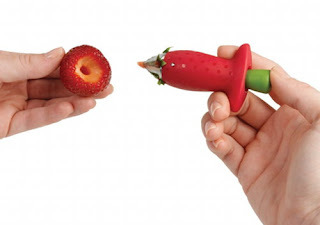 It's designed for removing the leaves and core from strawberries. This is exactly the type of gadget I would scoff if I saw it at a store. Because, of course, I can do that with a knife. So why do I need another device? Okay, I'll admit it. The Stem Gem is cute. It's a cheerful-looking tool. Surprisingly, it also works really well. Not only does it work perfectly on strawberries, but it also removes the core from tomatoes. Huh, maybe it is something that I needed all along, but I simply didn't realize it. Well, need is probably too strong of a word. 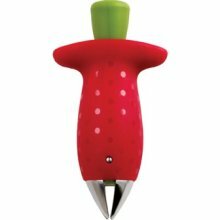 But this cute little gadget makes strawberry cleaning a lot easier. Less messy. Sort of fun. Neater. Faster. Amusing, even. Although a paring knife is a fine tool for cleaning strawberries, when I use a knife I tend to end up with a ragged hole in the berry. I was giddy with delight that this silly device gave me perfectly neat holes. Seriously, my husband came into the kitchen to see what I was giggling about, and there I was, tormenting innocent strawberries. And then I bought more strawberries just because it was such a fun tool to use. It's true. When you press the plunger on the Stem Gem, the jaws open. Press more, the jaws open wider for larger berries. You stab the teeth into the strawberry, release the plunger and twist. The jaws close a bit and the twist neatly cuts the core out of the berry. Remove the tool, open the jaws, and it spits out the core. Ptooey. Done. Once I got the rhythm down, I was whipping through strawberries in record time, and enjoying the task much more than usual. Cleaning strawberries is one of those chores that annoys me. I usually end up with strawberry seeds under my thumbnail. Don't ask me how I do that, but somehow I manage. And then I get cranky. Yes, the Stem Gem is a unitasker. No, you don't need one. Yes, you can use a pairing knife. If you're going to slice or chop the strawberries, or if they're starting to go soft and you need to do a lot of trimming, a knife might make more sense. But if you need to whip through a lot of berries and you want them to look neat and pretty when you're done, the Stem Gem does an excellent job. It would also be a great tool for kids to use, if they're not quite ready to handle a knife. Since it also works for tomatoes, it's not entirely a unitasker. I can imagine using this for cherry tomatoes this summer - not because a core needs to be removed, but to create a neat hole that I can stuff. This gadget is going to get a lot more use in my kitchen than I imagined, and that makes me happy. Products were supplied to me for review purposes.